Crews at the scene of the Gettysburg Drive fire on Bloomington's east side. 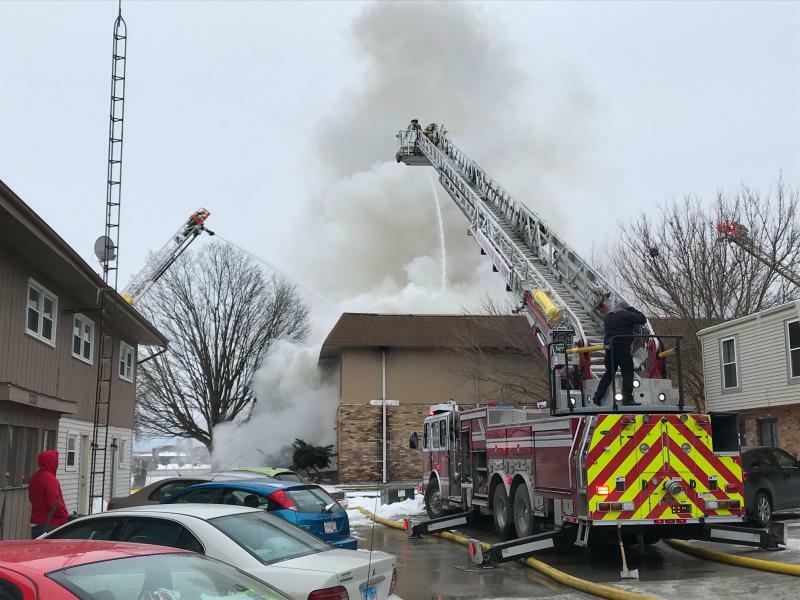 The Bloomington Fire Department said Wednesday the blaze that left 29 people in an apartment building homeless last month was caused by an accidental cooking fire. The department released no further details about the cause. A spokesman said a full report should be ready within the week. In January, city officials had cited the apartment building in the 1100 block of Gettysburg Drive for 226 housing violations prior to the fire, including inoperative smoke alarms in some units. The owner of the building, Wayne Pelhank, was facing fines of $19,150 for failing to address violations, including structural damage, broken doors and windows, water damage, buckling floors, dirty carpets and roach infestation, according to the city's demolition complaint, filed in McLean County Circuit Court. Some code violations at the building date back to May 2016. City Attorney Angela Fyans-Jimenez said some of those violations at the Gettysburg property were addressed. However, others remained open on Feb. 10, the date of the fire. Pelhank was to appear in administrative case on Feb 28. Fyans-Jimenez said the city continued to press the landlord for compliance at the building up until the time the fire occurred. Eitan Weltman, attorney for the landlord, declined comment. It remains unclear if the apartment building on Gettysburg Drive will be renovated or demolished. Weltman told the administrative court today that the landlord is waiting on a determination from his insurance company. Pelhank also faces a separate potential fine of $17,500 on 536 code violations involving various rental properties he owns in the 900 blocks of Front and Grove streets. Those violations include improperly working windows, boiler, heating, plumbing and electrical problems, broken doors and locks, water damage, floor damage and missing screens. Last week, the city moved to condemn a unit in yet another Pelhank property -- the Empire Townhomes complex in the 1900 block of Peach Street -- after a portion of the ceiling collapsed on a two-year-old child. "At this time, there is compliance and the property is no longer condemned," Fyans-Jimenez said.